"Poetry with a beat. That's hip hop in a flash. One part story, one part rhythm. And just like the church congregations from hundreds of years ago, listening to the "Call and Response," the people embrace the rhythm and remember the stories. ...Today there is hip hop everywhere. All over this world." 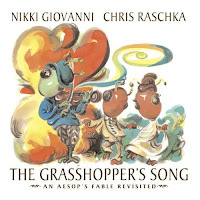 I sat in the porch, on a warm sunny day, and listened over and over again to these rhythms collected and edited by the amazing Nikki Giovanni. I thought it would give me a feeling for the hip hop cadence of some of the most notable poets and writers, and I was right! My toes were tapping, my head was bobbing and I was following along, hearing how these poems sound when gifted and talented performers share them. The CD is remarkable! What an addition to my poetry collection, and it is a book I will share in the classrooms I visit in the coming school year. Many poets are included and the performances are often given by the poets themselves...so special to hear. The illustrations burst with joy and share the same exuberance and rhythm as the chosen poems. They are meant to be read by middle graders, but go well beyond that and should be shared with both younger and older listeners. I loved the variety in the selections and reading them aloud with family or in classrooms will have everyone enjoying the beauty of the words and the rhythms of the language. They run the gamut from playful delight to sombre reflection and are each worthy of inclusion. Many talented poets have a place in this anthology...Eloise Greenfield, Walter Dean Myers, Langston Hughes, Maya Angelou, Nikki Grimes, Queen Latifah and Tupac Shakur to name a few. It is historical, funky, funny, emotional, and it opens our hearts and minds to the sounds of lovely language, the power of the hip hop beat, and the emotional resonance of poetry as a way of expressing ourselves. The back matter provides additional information about the poets and the musicians whose work is included and adds interest. "The school's smells were unfriendly and harsh against the tender skin of my inner nostrils. I craned my head in every possible direction I could, without moving my feet. It was like someone had enlarged the Hudson's Bay Company by many times and stripped it clean. My eyes darted from wall to wall, trying to take it all in." Even as a very young girl, Olemaun Pokiak is strong-willed, inquisitive and set on going to the school run by the outsiders. She wants to read and that means she must leave her small village and attend a residential school. Her family warns her about the school, but she never lets up on her request. Her father finally agrees and they make the five-day journey that will take her there. She is eight. At school she soon meets the Raven, a nun with a hooked nose and bony claws. Her dislike for this strong, opinionated young girl is quickly evident. Her persecution would humble a weaker student. Despite embarrassment and unceasing cruelty, 'Margaret' does not falter. She shows dignity in the worst of circumstances and can hold her head high when she finally leaves the school, able to read and write in English...her dream fulfilled. 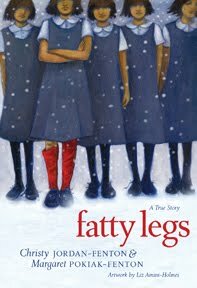 Archival photos from Margaret's collection give readers a sense of immediacy for the story being told and the strong, boldly colored artwork of Liz Amini-Holmes provides the clear and often heartbreaking truths about this brave woman's journey to literacy. "Once they were feared warriors. Now they live peaceably as nomadic cattle herders. They treat their cows as kindly as they do their children. Without the herd, the tribe might starve. To the Maasai, the cow is life." This is the story of Wilson Kimeli Naiyomah, told in collaboration. The September 11 tragedy affected the people of the world...it showed us our vulnerability, our compassion for the plight of others, and had an impact that reached beyond our shores to the rest of the world. This story takes us to a remote village in Africa where the Maasai people live in peace and tend their cattle. Kimeli has been away in America studying. His villagers want to hear his stories, and so he tells the story of the Twin Towers and their destruction. Once told, Kimeli patiently waits for their reaction. He knows they are 'easily moved to kindness when they hear of suffering or injustice.' In their world the cow is life. 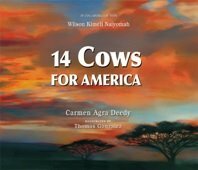 Kimeli offers his one cow to the people of the United States, wanting to help in some significant way. Members of his tribe follow his lead. An American diplomat makes his way to visit with the Maasai and to accept their gift of 14 cows, given in a sacred ceremony. the beauty of his people as they welcome him with open arms into the fold once more, and the joy and celebration of the sacred dance when the cows are given in honor of the American people. Each fully conveys the strength of this story. A website provides further information for those looking for more at www.14cowsforamerica.com. "Chicken, Pig, and Cow loved each other. Outside...and inside, it was always Chicken, Pig, and Cow. Then one day it wasn't. There was also Horse." 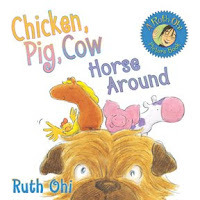 I hope that you have met Chicken, Pig and Cow in previous books. They are quite the characters and Ruth Ohi has a lovely way of giving them life in her fun-filled and detailed watercolors. They are always together and have great love for each other. When Horse arrives, they are quite taken with his agility and strength. Then they begin other not so ingratiating things. He takes up space meant for them. Ah, Chicken knows just what to do. She suggests a game of hide and seek. She sends Horse off to hide and then deilberately refuses to tell what she has done. Her conscience gets the better of her and she is off to find him. But, where? She searches in all the normal hiding places and he is nowhere to be found. What? Can that be him in the fishbowl? Clearly concerned for his safety Chicken flops into the bowl, only to find that Horse is not there. He is on the other side of the glass. To the rescue go Pig and Cow, soon quickly realizing that no one can float! Horse joins them. Chicken cannot tell a lie and sorrowfully apologizes to Horse for the trick she has played on him. All is well....except that they are all in the bowl with no means of escape. A bright idea from Chicken soon finds everyone safe and sound on the outside. There is something to be said about making new friends, isn't there? 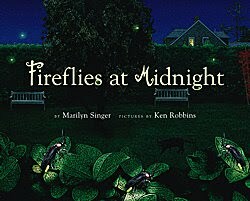 This is a great readaloud for young listeners, with lively illustrations and not too much text. There is much subtext in the artwork. Once you meet them, you will want to read their other adventures...Chicken, Pig, Cow (Annick, 2008), Chicken, Pig, Cow on the Move (Annick, 2009) and Chicken, Pig, Cow and the Purple Problem (Annick, 2010). They are a delight! "They made small heart tracks in the sand and followed her all around the beach. They invited the wind to come and kiss her toes. Abby and her sandals had a wonderful summer together." Those sandals seemed to be getting smaller, but Abby wasn't concerned. She loved them and she would wear them forever. Mom is trying to convince her that her sandals have done their job and now, she needs a new pair of shoes to wear. Abby is adamant...she wants her sandals. In the fall at the park Abby takes a ride on the swings and loses her shoes. Do they fall to the ground? No, they fly south! 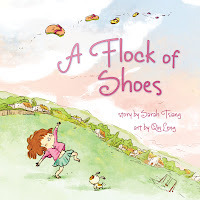 "Her sandals flipped and flopped in the sky, pretty as birds, and joined another couple of pairs of sandals, all in a V."
"Our straps are aching to hug you again." It isn't long until Abby discovers the delights of her new winter boots...she falls in love again. They are great for having fun in the snow and for keeping her toes cozy. When the whistle of a northbound train shatters the silence of a warm spring morning, we are not surprised to see the boots make tracks for the boxcars as they pass. It isn't long until Abby hears the swishy approach of 'glorious pink and brown, with lime green trim' sandals. They have had their rest and she is elated to welcome them back. "Early nights and gorgeous lights, but we still miss the warm wiggle of your toes." What a collaboration! The spare text has energy and storytelling power, while the whimsical watercolors give life to the characters, the setting and the relationship between parent and child, and child and her much loved footwear. Bravo! "What do you have there? Oh boy, you know where we're going with this, don't you? My daughter read this wondrous new book to me over the phone last week (she lives in Victoria and works in a book store) and I couldn't wait to get my hands on it! Then, thanks to Lisa Mior, Rita Silva and the great people at H B Fenn, I went to my mailbox and there it was...on the very day that Erin read it to me! So, I called her back and read it to her! We sometimes do those things. Then, I phoned Calgary and read it to my son. And I took it to a workshop the next morning and asked if I could read it to the people there. I love it and when you get a book you love, you just have to share it! So, here I am again...sharing it with you. 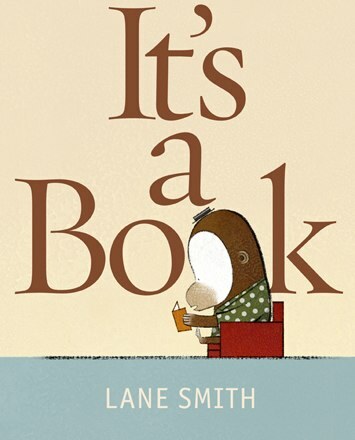 Lane Smith uses his artistic talent to give us rich characters and down home humor in this story of a jackass, a monkey and a mouse. While Monkey reads, Jackass (with laptop firmly clutched under his arm) has many questions. He obviously knows nothing about books, and cannot seem to understand the concept. When he asks about Monkey's mouse, Mouse pops out from under Monkey's hat. On we go with all the things that a book cannot do....text, tweet, Wi-Fi, or make noises. Monkey offers his book to Jackass so that he might discover its many features. Jackass is not impressed. And then, he starts reading and he is still reading 5 hours later! "Don't worry, I'll charge it up when I'm done!" Kids will love the naughtiness of the final line and respond with heartfelt hilarity and a plea for a repeat performance! Well deserved! If it doesn't suit your sensibility, please lighten up! It's priceless! "I lay on my back in the attic room. Vince twitched in his sleep in his bed just a few feet away. I felt guilty for not telling him what I knew. If he had told Lil- even accidentally - she'd think I'd somehow lost control of things in the Bike Barn. And I hadn't. But we were being robbed - just a little. I was sure of it." When I was teaching kindergarten in the early 70s, I read my kids their first school chapter book...The Boxcar Children. They loved it, and when they were reading independently they came back to the kindergarten to borrow it for a reread. I asked them what they loved about it, and it was mostly the fact that those kids could take care of themselves. They lived vicariously through them. They will do that now with the Mariss children as they take care of themselves and each other while their parents are caught in a fuel 'crunch'. The two older children, Lil and Dewey, have taken charge while their parents enjoy a short trip away from them. Their father is a trucker and their mother loves to go on an annual trip with him, while the children are out of school and content to be alone. This year, they run into difficulty when a shortage of fuel means rationing and waiting in long lines to fill up. Mom and Dad are concerned with their children's well-being and phone daily to check. Lil is taking care of the house and its many demands as best she can. Dewey and his younger brother Vince are keeping their Dad's small bike shop operating, while the demand for repairs and parts rises exponentially. Most people are biking to get where they are going and they don't have the knowledge or tools to keep their bikes in excellent condition. So, they bring them to the Bike Barn. The needs are great, the work is hard and Dewey is wearing himself out with worry. As the lines grow and customers become more insistent, Dewey and Lil try to balance running the business and providing for the other three siblings. They are overwhelmed with responsibility but lucky to have support from a tight-knit farming community. Their thieving neighbor takes a few eggs at a time, and occasionally needs their help with lawn mowing. When parts start to disappear from the bike shop, he is their chief suspect. Dewey is able to come face to face with the robber and the whole community is in for a big surprise. 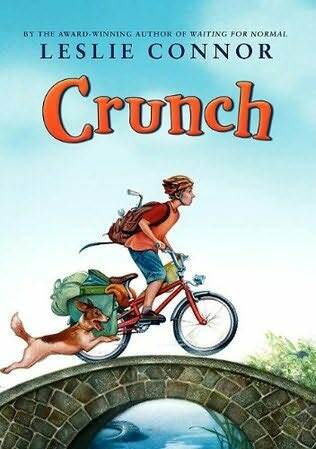 This is a great family story and readers will find themselves cheering for Lil and Dewey to keep the family thriving despite setbacks. There will be much to discuss when sharing it with your children or students. What might happen if we don't have the fuel we need to live the lives that we are so accustomed to living? How would you and your family deal without fuel powered transportation? How would it change your life? What happens when trucks can't transport food, water, and the other materials that make our lives easier? There is a lot to consider here. Luckily, the happy ending adds just the right touch! "What was Mickey Mouse's original name? In 1928, Walt Disney created a cartoon mouse he called Mortimer Mouse. Disney's wife didn't like the name Mortimer, so she renamed the character Mickey. Mickey Mouse made his movie debut in a cartoon called Steamboat Willie that same year." Do you know any child who doesn't ask why, when, what, where and how all day long? If not for their curious nature, they would never gain all the knowledge that they seem to do in a very short time. This book will add hours of pleasure, information and new learning for you and for them as you share it together. It is perfect nonfiction, providing bits of information, great graphics, and the answers to questions you might not be able to answer! How great is that? Nonfiction reading can be so much fun for all of us! Remember, it is what we mostly read...newspapers, instructions, lists, menus, charts, statistics. The list goes on. Our kids need experience with reading it, too. We all love learning new things and we learn about them in books such as this one. It has sections about animals, earth, space, humans, people and places, history, science, technology, art and culture and sports. It is a book that you will turn to again and again, to sharpen your knowledge and to add to your kids' view of the world. This one is for you, Jen! "Why don't kids who are color blind see everything in black and white? Life isn't black and white for kids who are color blind. In fact, color blind people can see most colors... Color blind kids might only be missing one particular type of cone, such as green or red. Although the person can see the other colors, they might see gray for the cones they are missing." It's great fun, and oh, so informative. You will find yourself picking it up again and again to answer questions from your kids and even some that you have. ENJOY! There is definitely a problem here and we are faced with it on the front endpapers, where five bunnies sit contemplating the blackboard. If newborn rabbits are fully grown at one month and able to be parents at two months, how many pairs will there be at the end of the month, or at the end of a year? The sign on the fence calls it 'Fibonacci's Field' and states that the population is 1. It's January and that solemn and solitary bunny issues an invitation to another bunny for friendship and an end to the loneliness. In February the temperature takes a big dip and 'snuggling up' seems the best way to keep warm. It's much too cold to knit. In March, the lonely and cold rabbit problem has become one of babies...a new pair. The calendar sports a name chart, and a growing list of responsibilities for the new parents. A birth announcement is attached, with names, photos and the family 'carrot' to show lineage. With each new month comes new hilarity in the burgeoning growth of the rabbit population. April brings much rain and more rabbits. May sports a ration book, with coupons to use to provide for each new addition and an order form for seeds for planting. The seeds arrive and the family grows in June. July brings boredom and a local newspaper offering news, birth announcements, weather reports and the birth rate dilemma. On we go through the months, with growing numbers and an explosion in carrot production. December brings a solution with a sign change and an exodus from Fibonacci's Field. Whew! There are books that delight and this is one of them! As you share it, you will find that you and your listeners (and they need to be close to see all there is to see) are poring over each turn of the calendar and astounded at the plight of the many rabbits who inhabit the field. Younger children will love the sharing and the talk, while older readers will have a heyday on their own! 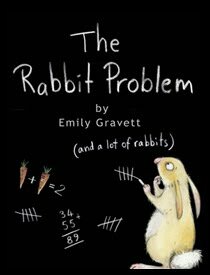 If you have not seen Emily Gravett's work, please run (yes, run) to the library, or your nearest bookstore, and check her out. Her artwork is stunning, the premise for her storytelling is so original and entertaining and you will have found new favorites to read repeatedly. Watch the expressions, check out the many details and glory in the experience. It is worth every minute spent! Get stacking up those Christmas gifts! "Lulu looked surprised. "Today?" she asked. "I really don't want to take my lesson today...I didn't practice." 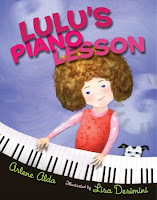 But Lulu packed up her music and slowly walked to her piano teacher's house." Author Arlene Alda has something to say about music and practicing: "When I was a kid, I loved music but hated to practice". She eventually gave up piano lessons and fell in love with the clarinet, which she played in the Houston Symphony. Lulu may have gained life in the early experiences of this accomplished author. Lulu loves the sounds around her...the swing squeak as she sails through the air, and the ring of the bell on her bicycle as she and her friend Cara ride up and down the street. What with all the distractions and fun in the neighborhood, Lulu has little time to think about the 'next' piano lesson. "The music of the piano lesson was still in Lulu's head, this time played by a huge orchestra..."
Lisa Desimini uses her unique and engaging mixed media collages to give voice to the sounds that Lulu hears as she bounces through her week, enjoying life to the fullest. The bright palette adds warmth and delight to this young girl's love of music, in all of its forms. "At the apartment building, another helicopter finally arrived to rescue Catrina Williams and the others. They were dropped off at an emergency shelter in San Antonio, Texas, not knowing the children had been dropped off somewhere else. They searched the sea of faces there, begged busy workers for information, and scoured bulletin boards splattered with photos of those missing or found. Their search turned up empty. The children were not there." There are twenty-two stories here and each is amazing in its power and lasting impact. The people who found themselves in severe crisis also managed to react with honor, determination, bravery and quick thinking. Many of the stories come from Canada, but others are from around the world and take the reader where they are not likely to travel. Each is told in a skilled and concise manner and will leave its audience informed and suitably impressed with the chosen actions. The author asks the important questions about what we might do when pushed to the edge by circumstances beyond our control. Would you: "Hide or escape? Resist or submit? Stay and help or flee to safety?” I guess we just don't know until we are in the place and time. Then, he organizes his stories in four groups concerning disaster, terror, injustice and the impossible. Have I got your attention? I hope so. Larry Verstraete certainly will have the minute you pick up this book and start reading. It is very difficult to put it away...so be prepared to sit, relax and be astounded. In addition to the stories there are shorter articles labeled CALL TO ACTION. Once read, interested readers can check for further information in the back matter, which includes Further Reading. From Iran to Berlin, from Russia to Peru, and right here in our own backyard, there are people who are to be admired for their reaction to adversity, to pain, to terror and to disquiet. He gives the facts but he also provides for the feelings felt in each of his short entries. If you like adventure and are inspired by others, you can't help but love this book! "Jillian Searle couldn't stay above water - not with both children." "The polar bear ripped apart the tent and mauled the campers inside. Armed with only a pocket knife, what chance did Eric Fortier have?" "The two boys had been hand-picked by Josef Mengele, Hitler's notorious henchman. It would take a bold step to save their lives." "Their plan was a wild one, and the chance of failure was greater than any chance of success." If you aren't enticed to get this book and find the truth in these stories, there is nothing more I can do. Wouldn't it be great to start each September day in your new intermediate/middle years classroom about these honorable people of the world? "What a letdown! Elijah knew engines inside out. He knew how to design them. He knew how to build them. He also knew the boss didn't think much of him because he was Black. But Elijah needed work, so he took the job. The steam locomotive was exciting. People called it the Iron Horse. It was a fire-breathing monster." This is the second picture book biography for this team. It is the story of Elijah McCoy who invented a system of lubrication that changed the steam engine, making travel safer for its passengers and more efficient for its owners. Elijah was a born learner and when he settled in Detroit after being schooled in Scotland, he wanted more than anything else to be the mechanical engineer he was trained to be. Unfortunately, being black made that impossible in a racist society. Rather than working at his profession, he shovelled the coal that kept the train moving. His affinity for finding the best in everything led to a better life for Elijah himself. He is a man to be admired. He had a creative soul and showed perseverance against the odds. That is what makes this book about his life so engaging. As a child he showed his enthusiasm and dedication in the pursuit of his dreams; as an adult he pushed beyond the barriers that threatened him to do the job he was trained to do! As with other picture book biographies this one will encourage young readers to take a closer look at Elijah McCoy and his life's work. Not only is his invention a source of interest; we are also made aware of slavery, racism, the dedication of inventors, and railroad history. Any of those themes might provide a jumping off point for further study. The writing is very readable, the story well told and the illustrations add historical interest and impact. I liked the opening poem about the Underground Railroad, a very different kind of railroad that the one where Elijah worked; but one that impacted his life as much as the other. In a afterword, Monica Kulling explains how the expression 'the real McCoy' might have become a part of our language...and also lets her readers know that Elijah did not stop at one invention. Do you wonder what else came from his energetic and inventive mind? It's up to you now to check him out! 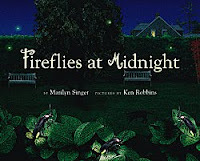 It's warm summer, and creatures of both day and night are up and about, doing what they do best. The robin awakens our poetic souls with a cheery song while protecting and boasting about her eggs, just waiting to hatch and be the beneficiaries of the many worms found below. The facing photograph feels like a painting and shows her pride of place alongside her nestled eggs. or the clever crayfish crunch"
Can't you just hear your students tripping over those delightful words? On we go through the day with a varied lot of summer creatures. Marilyn Singer is adept at creating their 'voices' in rhythmic lines and phrasing, helping us to delight in the cool freedom of the morning and the lethargic heat of the afternoon for the horse, the drudgery of needing everyone's help to move their picnic place to place for hundreds of ants, the patience of the eft waiting to find its way across a minefield of danger to the cooling magic of the pond and the furtive anxiety of a rabbit wanting to remain invisible. Moving toward darkness, she introduces the bat with its quick movements and ability to 'see' in the dark, the frog as it croaks its regal song, the fireflies as they flit and dive looking for romance, the red fox as she teaches her kits to forage, the spider whose work is never done and the always weary mole dreaming of its next meal. In this companion to Turtle in July, Marilyn Singer shows readers the power of poetry for storytelling. Ken Robbins uses digitally enhanced photographs to create the perfect setting for each of the featured creatures. We are the lucky ones who get to share this wonderful collection! "An explosion happens when there is a rapid release of energy, usually because gases that are under extreme pressure need more space. They push with great force against whatever is holding them back. When the explosion finally happens, and the container bursts, there's usually a loud bang." 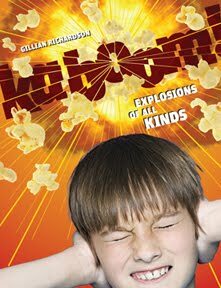 There are moments of horror and moments of hilarity as you read this most enjoyable book about explosions and how they occur. The photographs are amazing, full of beauty and detail. Gillian Richardson chose a subject that will entice and entertain, while also informing her readers with facts, artwork, archival material and kabooms, past and present. The cover invites us in, the writing keeps us reading. She has chosen to talk about two different types of explosion: natural and man made. There is much to learn. "The seeds of the jack pine, a tree found in eastern North America, are only released after a forest fire. The fire's extreme heat expands air inside the cones and forces them open. The jack pine is one of the first trees to take root in the burnt ground." Some of the horrifying bits come while she is describing animal explosions including flatulence and a real exploding whale and thousands of toads. EWWWW! The 'explosions we create' part of the book helps us learn about both destructive and constructive ones. Destructive explosions include gunpowder, dynamite, bombs and includes a two page spread chronicling the explosion in Halifax in 1917. When describing constructive explosions, the author talks about using almost thirteen hundred tonnes of explosives to dismantle Ripple Rock in 1958 and more than '30 million kilograms of dynamite, 84,000 people and 34 years' to build the Panama Canal. Wow! We have been witness to planned demolitions and their remarkable implosions. Don't forget fireworks...explosive brilliance and beauty to mark special occasions. Back matter includes a selected bibliography, a table of contents, an index and a list of books and web sites for further study. "You might erupt with laughter at a hilarious scene in a movie. Does your friend have an explosive temper that is easily triggered if he doesn't get what he wants? Did your mom blow up when she saw the mess you left after making pizza? Did you eat so much that you thought you'd burst or explode? At the best parties, you might have a blast!" "Nobody made ridiculous suggestions. Chocolate meatloaf! Peanut butter and turnip soup! Spaghetti and applesauce dumplings!" 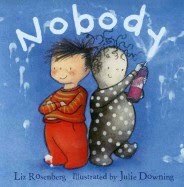 Don't you wish you had a 'nobody'? When Erin was three, and for a very short time, she had an imaginary friend. I wish I could remember her name. She was a daily guest for meals, and play time. We were admonished if we closed the kitchen door as the friend was often on the other side. I don't ever remember Erin blaming her friend for shared trouble; but, I rarely remember Erin being in trouble! So, she came and went and we were not sure why Erin found comfort in her presence, but she did. Often imaginary friends take the rap for misbehavior. In this fun-filled story about such a friendship, Nobody is the culprit. The minute George opens his eyes he knows that Nobody is awake and moving. The parents are not. Neither is the dog. Nobody won't be tethered or taken lightly. He encourages fun and frolic in the kitchen and George's inner cook is released. They spin about the kitchen creating one gourmet delight after the other. Since they have to wait for parental supervision before cooking anything, they fill. their time with new games. The parents' immediate reaction is dismay and confusion. Luckily they take a breath and give hugs and kisses. Then, while Dad cleans up, Mom asks for help with Sunday pancakes. With Mom's attention focused on her toddler son, Nobody diminishes. As they work, George realizes that the fun he had earlier wouldn't have been such if Nobody hadn't been there. Soon, Nobody is back in the picture and helping with the feast. "And Nobody ate more than George." It's been a long time since I met one but I would guess that imaginary friends are still there, assuaging fears and being a friend when one is needed. Liz Rosenberg handles the events with charm and daring. Julie Downing creates a warm and funny Nobody in black and white and fills the rest of her illustrations with bold color, frenetic energy and a sense of calm when the parents descend. It's so much fun! "I was thinking so hard all my circuits were loaded. And numbers flew out of my head by the score. They stuck to the ceiling; they bounced off the floor!" Poor young mathematician....she thought she knew the times tables until the attention turned to her. In what experts would call an 'temporary attack of dyscalculia' her ability to recall the answer to the question flies out the window (well literally, out of her head) and causes disruption for everyone around her. As the numbers fly past the teacher, she sends her young charge to the nurse for consultation. It isn't until the nurse asks for the whole story that it starts all over again...this time sending the nurse running for safety outside the school where the principal is megaphoning for help! The police arrive and get the same results while trying to get to the bottom of the problem. Oh, my! The town is in disarray and no solution seems evident. Even the local news is called for an interview...they get first hand footage of the problem. Can the National Guard provide the help needed? Suddenly the gears in her head leap into action and everything falls back into place. Tranquility reigns. Until the next math problem is voiced! 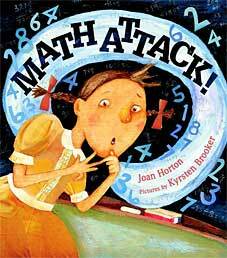 This would be a fun book to include on your list of literature for use in the math class. I didn't know that dyscalculia was a diagnosis for those who have number difficulties and so, I found myself learning something new....life is good! Kids will love the wildness of the illustrations as they chronicle the personal turmoil of our heroine, the confusion that results from out of control numbers, the satisfaction of finally getting it right and then, the consternation that she might be called on again. The mixed media artwork adds interest and will intrigue the observant reader. "At first the dog was forbidden to climb on the furniture, but Riley discovered that he could sneak onto the basement couch and leap off before anyone saw him. As he got older, he was caught sometimes. Now that Riley is frail, Jack lifts him onto the couch and lets him rest. Come and explore the unique connections between people and their pets." Is there an 'incredible connection between people and their pets'? You bet there is! I don't have first hand knowledge of it as I have never had a pet; but, I have friends, relatives and a son and daughter-in-law whose lives revolve around their pet(s) and the love they have in their hearts for each other. So, here's to Percy, Bret and Carmen! The audience for this book is targeted at 8 to 12 year olds. I am sure you know someone younger who will enjoy hearing what it has to say. I know I know someone much older....me! I found this book to be informative, funny and it held my attention for the entire reading. It doesn't matter if you think you are a dog person and don't need to know anything about cats, or the other way around. You will find much to keep you entertained as you read it on your own (as I did) or share it with others (as I will). There is a short instructive chapter about pets and the reasons that we love them so. Our brain reacts to the warm and loving feelings we get from those pets through the response of our amygdala. They tug at our emotions. Following that introduction we move on to some of the more unusual pets that people have been known to keep. You know what I mean...the monkeys, tigers, kinkajou, snakes, bears, as well as horses, birds, rodents and fish. Then we spend a lot of time with those pets that are most common...cats and dogs. And the soul of our little bookstore. A box-captioned illustration of a dog person gives an up close look at the lengths dog owners go to keep their 'best friend' happy. This section repeats the detailed format of the previous one...answering questions, giving advice, introducing us to personal stories. The reading is lively, and accompanied by the clear, engaging illustrations of award winning artist Bill Slavin. They are sure to invite you in and to encourage a long stay! Is your mind on Christmas yet? This would be a great gift for a pet owner, or someone who longs to be one. There is so much to learn and enjoy about the connection between owners and their beloved pets. And, there is a great poster on the back of the book's cover! "All of us support and profit from slavery in some way, even if we don’t mean to or don’t realize it. The phenomenon of globalization means that the goods we buy are increasingly assembled in different parts of the world, using components from all over the world … Some of the steel in your car may have been made using pig iron or charcoal that was produced by slaves in Brazil. Similarly, a handful of the sugar in the jar at home may have come from sugar cane harvested by slaves in the Dominican Republic. Slavery infiltrates our lives through increasingly global markets. Slavery surrounds us. It is a twenty-first century problem." We can't hide our heads in the sand and pretend our lives are not affected by slavery somewhere in the world. This book makes it very clear in easily read (while not easily digested) text that slavery exists for field hands, garment workers, prostitutes, domestics through all corners of the world. We are not immune to it. Slavery is hard to find because it is illegal, and so is forced to the underbelly of society. It is more prevalent where governments are ineffective, due to war, corruption and poverty. It is not the same kind of slavery of past centuries, when people were bought and sold under a nation's laws to work farms and plantations for the benefit of their owners. There is no nation in the world today that allows slavery...that is the law. But, there is slavery everywhere. While historically, slavery had to do with racism...whites owning blacks, today slaves are cheaper than they have ever been and they are likely to be owned by people of their own culture in their own nations. It is disheartening to know that no matter how we feel about it, there is little we can do. If we decide not to buy certain products from around the world, it has little effect on enslaved people. Their numbers are relatively small. However, it can cause untold hardship for the farmers who are just doing their job and trying to do it to the best of their ability. When we stop buying their products, their livelihood is gone and now they are unable to support themselves and their families. If those who have slaves cannot make a profit one way, they will find another. We can lobby governments and do our small part to help organizations that work toward freedom for all slaves. More importantly, we can share books such as this one with our teenagers, giving them the opportunity to listen and to talk about what these authors have to share with us. The more we know, the better able we are to have opinions and to think about solutions that might be workable from our own perspective. Slavery is a huge global issue; as with so many other atrocities, we can start small, in our little corner of the world by informing ourselves and working to find solutions one step at a time. I think this would be a great book to share in middle and high school classrooms to bring awareness and a sense of outrage, while also encouraging people to work together for the the greater good. The writing is conversational and there are personal stories that will resonate with readers and listeners. As hard as it is to learn so much about slavery in the world today, I think we are better for it. "Jimmy Grasshopper feels he is not respected by the Ants for the work he has done. He wants us to sue. What do you think?" The first one to speak was Lori Wren. "Jimmy is right. Almost every year, one of the Grasshoppers comes to make music. I have my office windows open and hear the most wonderful sounds. He should be paid." Henry Jr. spoke next. "It will be a tricky case, because the Ants didn't actually contract with the Grasshoppers for a service." Does this quote sound like this might be 'an Aesop's fable revisited'? While some of the events are part of the original, there is much that is new and intriguing for young readers. It seems that the same thing happens year after year. While the Ants work, the Grasshoppers provide the songs that keep them working efficiently. Then, with the arrival of winter, the Ants are quick to snub the Grasshoppers who have provided so much incentive to their work. This time when Grasshopper is left out of his share, he decides to sue and hires the law firm of Robin, Robin, Robin and Wren to represent him. The trial is presided over by Judge Owl and a chosen jury of creatures of the forest. There is a host of issues to be considered and the author makes us witness to each of them. The lawyer for the Ants acknowledges that they enjoyed the music...of course, they did. But they didn't ask him to perform and he didn't have a contract. The Grasshopper wonders if everything must be contracted in life. "You will, throughout this trial, hear expert testimony about the benefits of music. It has been proven that those who sing, those who make music, play a key role in the survival of all life - mammals, reptiles, amphibians, birds, fish and insects." "Now he finds himself with nothing. Is this the responsibility of Nestor and Abigail Ant? Mr. Grasshopper chose not to prepare for the future. Well, ladies and gentlemen of the jury, we are asking you to send a message. Those who fritter summer away will have to pay winter's price." I will not be the spoiler but it is a trial worth attending and an ending worth celebrating. Chris Raschka's charming, earth tone watercolors bring us right into the middle and muddle of the story. The animals are expressive, and natty in their 'going to court' attire. There is much here to see and enjoy. "POOR PIERRE! He lived all alone at the foot of a sky-high mountain, and ah, his heart, how it longed for a friend. "Perhaps," said Pierre, "I could find a friend on the other side of the mountain." He hops into his little red car. While it has lots of power, there are many zigzags in the road to the top of the mountain. With every turn, he honksd his horn and heads further afield in search of great happiness. Rounding a corner with his horn blasting, he comes face to frightened face with a goat. Well, the goat likes the look of the car and is willing to give aid in finding a friend. Off they go! The same scenario plays itself out...with a sheep, and a bear! They take turns tooting the horn, and seem pleased to be sharing each other's company. As would happen, they run into difficulty when they blow a tire. With a little help from his passengers, Pierre gets his car to the mountain, on the way to the other side where he is sure to find a friend. Whee! Down they go! The fact that they have no brakes is met with much ballyhooing. A crash leaves the little red car in pieces, but its occupants safe and in one piece. Come to discover there is no one living on this side of the mountain. With no car, Pierre decides to stay put. And guess what, so do all his 'friends'! What a great story about finding friends when you least expect it! It would be a wonderful readaloud on the first day of school as teachers work to build community and caring in their classroom. 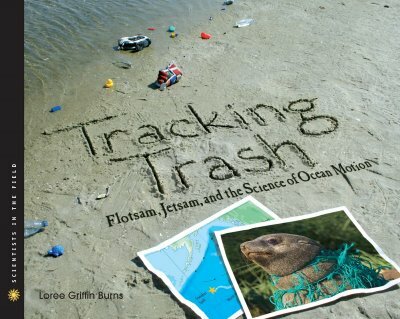 "Tracking toys and sneakers gives us a chance to see what the ocean does with our trash," Curt says. "We can see the movement of trash by the great ocean currents and we can see the disintegration of the trash over time...and we can learn from it." For Curt Ebbesmeyer a newspaper story about washed-up sneakers along the west coast of North America changed his focus for studying the ocean currents. As he talked with beachcombers up and down the coast he found that sneakers had washed ashore from California north to the Queen Charlotte Islands. After much research and many months of work, he was contacted by the Nike company who had lost five containers of sneakers off a cargo ship...five of a total of twenty-one lost in a vicious storm. He now thinks that between two and ten thousand of these containers fall from ships each year. Where do they go? What happens to what they hold? Ah, just what a scientist needs to start looking for answers. Here's an interesting fact that you might not have discovered (unless you read this informative and thoughtful book): "there are nearly 1,000 nautical miles of floating plastic trash stuck in a swirling vortex of ocean currents between California and Hawaii. That's twice the size Texas and 3 million tons of plastic refuse that scientists refer to as "The Garbage Patch." So much for where some of our trash goes. I wonder how much is plastic water bottles? Because Ebbesmeyer's interest lies in ocean currents, he became part of a discussion concerning the pollution of the oceans and the threats that are posed for marine life. Many scientists are working to clean up the dangers that plague our waters and Loree Burns does a credible job of introducing them and the work they do. She does so in such a clear and engaging manner that I forgot I was reading nonfiction. It is like a story told between friends and is bound to garner interest for those intermediate and middle grade students who are developing concern for the planet and wanting to do something about it. It should be so for every one of us! The excellent photos and detailed maps and charts give readers an up close and personal look at the scientists and their findings, the beachcombers and their treasure and the peril that is the 'garbage patch'. It is disgusting to see what people dump in our waterways, and heartbreaking to see photos of dead birds and animals who have been caught in ghost nets, or who have ingested the junk that is dumped. Curt is no longer working as an oceanographic consultant; but he continues to track trash, talk to beachcombers and tell school children about the wonders of the oceans that he loves. By studying such a book, we come to understand more about them, and finally find ways to protect their future. You know I love this spectacular series from Houghton...I will keep telling you about the Scientists in the Field books as long as they keep publishing them. Well done! My wishes gathered like ants. I wished there were no recess. I wished there was no first day. Would come over and ask me to play. Then you said, "Excuse me. Would you keep me company? I loved you that day. The little girl's face shows the sheer delight she feels when Miss Stone makes a special effort to make her day better. Do we realize what small gestures mean for so many? In this new remarkable collection by award winning and highly respected poet and anthologist, Lee Bennett Hopkins, we benefit from unparalleled skill at choosing wonderful poems from a wide variety of accomplished writers. It is serendipitous that Chris Soenpiet was chosen to illustrate them. He captures every nuance suggested in the words and seems privy to all the feelings and memories that spawned the poetry. I wonder how he does that? The first, and title, poem is about an amazing face...the face of a new baby. So much to be anticipated with its arrival. The mother beams, as does baby with all the joy of sharing their lives. In the next a young boy sleeps soundly while his mother works at her sewing machine doing the work that provides for life for both. The look on the mother's face as she gazes upon her son is filled with pride and love. And on we go...from one lovely poem and matching spectacular illustration to the next. I have already decided which will be marked for sharing with a group of teachers attending a summer institute in two weeks. They will be extending their learning concerning working with English language learners and the poem ME x 2 is a perfect introduction. I can't wait. I will surely have other favorites to share depending on where I am and what the focus is. As a retired teacher, you can guess why I chose MISS STONE for my featured poem. This is a very special collection and one of my new favorite books of poetry...with indelible poems accompanied by 'amazing faces' at every turn. Just look at the cover art and stare in wonder at the joy etched there! "Do you know how to scare a bear? Would you bang pots and pans? Would you rattle some cans? Would you ring a loud bell?" Just as it is important for schoolchildren to know the whys and hows of practising fire drills, it is important for children and adults who might be in bear country to know what to do if confronted with one of the ursine persuasion. It is better to be safe than sorry! 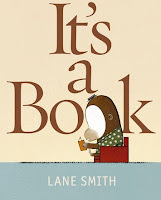 In lively rhyming text children are asked about their actions when confronted by a bear. Of course, the bear is downright uncooperative. Despite all the pot banging and noisemaking, he isn't scared. Then, what? Many suggestions are given, but the bear seems undeterred by each and every one. When scaring doesn't work, the bear decides to go swimming. Are there rules about a bear being in the lake, and does he care? Out of the water and into a boat...is fishing what he wants to do? Perhaps he's hungry. Are you prepared to offer dinner? Do you know what bears eat? On and on it goes through campfire time and lights out...the bear seems to be a permanent, and certainly peristent, visitor. A phone call alerts the park ranger and he has the 'just right' solution to the problem bear. One simple word...BOO! The illustrations add warmth humor and give a face to the relentless bear, and to the camp goers who would like him to leave them alone. They have many ideas, but none seem to work. And actually, they don't look that upset to have the bear amongst them. 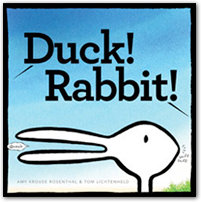 Pair this with Moose on the Loose (Sleeping Bear Press, 2009)for some all-out animal fun! "BUUUURRRRP! Excuse me! In many cultures, burping (or belching) is considered rude, especially if you do a loud, smelly belch at the dinner table. In some countries, however, such as China and Ghana, a belch can be acceptable, because it means you enjoyed your food." EEEEWWWWW! There is a YUCK FACTOR included with each of these entries and it is pretty accurate. One yucky face is 'a little gross' moving up to five which is 'totally disgusting!' There are truly disgusting things in nature and among humans and we are lucky enough to begin with the fact that hippos 'spin their tails around when they poo, spraying muck everywhere!' Good grief! Did I need to know that? Well, I'm not sure but there are thousands of kids who will think that this is the best book to come along in ages. You know the ones! The conversation at the dinner table or on a visit to relatives is bound to be lively if this is the current reading material of your children. Let them just get their hands on it and they will regale you with a plethora of facts you never wanted to know. It reads like the Guinness Book of World Records when it comes to things vile and gross. And it will be so much fun for them, while it will also teach them much about the world that they may not have previously considered. Each page is alive with facts, photos, tips, did you knows? and the yuck factor. The clear, colorful photos will inspire kids to read their captions to learn about the featured creature and other information is clearly stated in titled paragraphs. Spiders, wasps, worms, maggots, beetles, jellyfish, lizards, snot, poo, spit...they are all here in their gruesome glory! Read on, if you dare! WOW! I didn't realize until early this morning that I had posted 500 books and the big day was yesterday! It has been such fun for me, and I am encouraged by your comments, and the people who stop me to tell me that they enjoy reading my blog. That's why I do it. There are so many wonderful books out there and it is impossible to know about all of them. I am just trying to do my small part to get people excited about the book industry that exists for our children and the amazing authors and illustrators who share their talents, their ideas and their energy with us. It is a pleasure to have the time to do it and I am indebted to a huge number of publicity people who represent these artists and their publishers. They make this blog possible, and I salute them for that! Thanks for reading. I promise to keep bringing some of my favorite new books to your attention in the days and months to come. "Two legs, two arms, a head, two eyes...human beings share certain characteristics. Yet, human beings each have unique characteristics that set them apart from each other. You know your friends by the way they look and by the sound of their voices. We have the same body systems inside, and, yet, in appearance we all look very different." Our body begins with cells, tissues and organs. A simple explanation of each leads the way to making many discoveries about the way that our bodies are formed and make us who we are. Each two page spread offers up information boxes, full color photos, and a short description. The Brainwaves add humor, and little tidbits of information to enhance the learning. From the skeleton and muscles we are guided to the brain and nervous system. As the brain communicates through that system we make quick moves to protect us from harm and also automatic moves like blinking, sneezing and yawning. The details provided will be understood easily by young readers. The heart and its workings and the blood cells are the next stop on our journey. Here again photos and drawings, with short spurts of text show kids what they want to know about how their own body works. "You take about 25.000 breaths each day and night. You munch your way through about 500 kg of food a year. That's the same weight as 20 nine year olds! You are a tiny bit taller in the mornings, because during the day the cartilage pads in your spine become a little squished!" Now, who wouldn't want to know that? And can't you just hear the table conversation at Nana's the next time you visit? Add a glossary and an index and you have another of those wonderful meant-just-for-kids books of nonfiction from the fine folks at Dorling Kindersley and another addition to the "The Little Brainwaves investigate..." series. "Our body may be the first and is certainly the most remarkable thing we learn to take for granted. Because it works twenty-four hours a day, seven days a week, and makes only a few routine demands on our schedules, it's hardly surprising that we're much more familiar with its outside appearance than we are with what's going on inside. That is, of course, until something goes wrong. But why wait for trouble to stimulate curiosity? Each of us owns and inhabits an exceptional example of biological engineering and one that deserves to be understood and celebrated." It was that curiosity that led this remarkable artist to spend six years of his life 'getting it right'. He did so through research, attending classes, spending time in hospitals and hospital operating rooms in an effort to do just what he did...create this amazing 336 page book that celebrates what makes each of us tick! It is clear that for David Macaulay nothing beats the body for interest and intrigue. Because there is no beginning, middle and end to the body, it was difficult to determine where to begin. After some deliberation he decided to start with the building blocks and move on from there. In Building Life, the first chapter, he describes our most basic structure...the cell. All living things are made of vast numbers of them. In clear language and with detailed drawings, he explains how cells become the tissues and systems that make us who we are. I love the chapter titles that follow: Air Traffic Control, Let's Eat, Who's In Charge Here?, Battle Stations, Moving On and Extending the Line. His idea in writing the book, beyond informing himself about something he had long ignored, was 'to take readers on a quick tour of their own bodies, beginning with an explanation of the body’s basic cellular structure and including all the major physiological systems and processes'. That he has done! And he adds: 'And just as a good tour guide knows when to crack a joke or tell an amusing anecdote, I tried to inject a little humor here and there. Granted, that may not be the way they do it at Harvard Medical School, but then The Way We Work isn’t intended as a how-to guide for doctors.' That humor is evident throughout and will take some keen observation to catch it all. Lively color captures our attention and scientific accuracy of the many drawings. The final image shows a newborn crowning. We see only the top of the head and know that life begins again, returning us to the beginning of the book to begin our journey just as this tiny babe begins his. 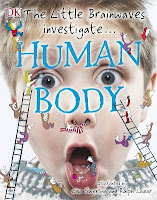 Macaulay wants his young readers to know that the body is a machine...amazing and complicated. He uses that idea to present clear, concise illustrations to impart that belief. He does it with his usual panache and adults who share this book will find themselves learning a lot they did not previously know and returning time and again for further insights. Bravo! when I was tryin' t' get me winks! I remembered 'twas the first day of school." Oh, I am going to love reading this book in classrooms this fall! It isn't because that 'great scrurvy dog' looks just like my granddog, Percy. But, that adds some appeal, I must admit. The greatest appeal comes from the language and the fun. It is full out pirate conversation throughout the whole of the story and is a perfect readaloud! This boy is a pirate through and through and his imagination turns each moment of the day into the kind of adventure that any pirate worth his salt would conjure up. He's up and off to 'shine his snappers' (brush his teeth) and put on 'me hook, me boots and my three corner hat -'. Them are the only clothes fit for this pirate. Once breakfast is done, he's off to catch his boat and head for school. Imagine the surprise when his first grade teacher's name is Silver...and she has a lot in store for her new crew. Hard work and constant motion leaves all new students tired by recess. With a full out run and some mischief that results in renewed energy and one of the buccaneer's walking the plank, he's ready to go back to work. As the day draws to an end, it is Old Silver who hands him a marked map that leads surely to the greatest treasure of all...the library. I love the double story told in the illustrations. As our young narrator imagines for himself the grand sea adventure of his first day, he is joined by a motley crew of marauders who keep watch, delighting in the goings-on and helping when help is needed. The full color art that depicts our young hero's day is mirrored by the sea robbers, fashioned in sepia tones but always present. Homework is added on the back endpapers so that enthralled listeners might learn the lingo and set themselves a course to being errant pirates themselves. Don't miss the back cover portrait...that's our Percy! AVAST, ME HEARTIES! You'll be needin' this book! "We do know that pirates were not all alike. Most did swear a lot. But which one got loot by sneaking her hand under the mattresses of sleeping captains? Who made his crew drink their own urine? Which one spent his days on deck wearing pajamas? Which patiently pulled a parasitic worm out of his leg - all two feet of it? What was the oddest thing about our hairiest pirate? Who kept her pirate ship tethered to the bedpost in her castle? Who personally led his crew in religious services twice a day? Who provoked the most mutinies against him? And which pirate sprinkled her troops with garlic water before raids?" What is it about pirates? Why are we so interested in their lives, their deaths and everything in between? 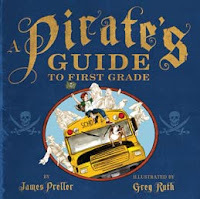 If her introduction to the pirates in her newest book has you pondering the answers to the above questions, you should know that one hour ago I did not have the answers. Now, I do! As in her previous books about the lives of musicians, writers, artists, athletes, presidents, and extraordinary women, Kathleen Krull has researched the lives of some of history's most notorious pirates and provides a most entertaining and informative look as their exploits. I found it accessible for her target audience, and I think it could easily lead to eager researchers wanting to know more about one or two of those presented. To that end, the author has included a 'for further reading' page in the back matter. I loved that she finished with Long John Silver, not a real pirate, as she is quick to point out. But, Long John is the first pirate I ever met, and I still remember the terror I felt as I read that book and tried to picture him, his minions, Jim Hawkins and the rest of the characters who peopled his amazing adventure. She reminds us that some of what we believe about pirates today comes from Robert Louis Stevenson's fertile imagination. Witness Captain Jack Sparrow! "In fact, it continues to this day, mostly in areas where crushing poverty coexists with unpoliced oceans. There are hundreds of pirate attacks on ships every year, especially around the Philippines, Indonesia, parts of South America, Nigeria, and Somalia. Now the targets are often oil and gas tankers or ships carrying drugs." "To be on "the coyote road" in Native American legends means to be headed to a wild, unpredictable, and transformative destiny...to follow the path of Trickster, which is neither a safe nor a comfortable place to be. Walk warily. He may rob you of the things you move most, or gift you with the things that you most need. Or both. But one thing's certain. He's going to shake you up. And probably have a good laugh about it, too." I swore I would not read this book until I had finished the two already started. But, I looked at it every day as it sat there on the shelf and finally gave myself permission with the caveat that 'I would only read a couple of the stories'. Now I am done and, when I have finished telling you about it, I will return to the others. This is a book that should find a place of prominence on a teacher's desk, or an adolescent's night table, to be picked up and read when the mood strikes. There are many wonderful stories here, and you would do well to share in them. They are often short, with much action and engaging for reluctant readers, too. The tricksters are impressive and hold interest as the story moves forward, always keeping them at the forefront. 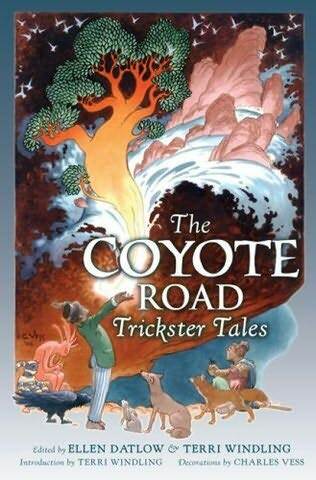 Trickster tales have been favorites of mine for a long time, most shared in picture book form. They are entertaining, while frightening. They show the good and bad that is in the world. They often make us stop to think about our own strengths and imperfections. They come from many cultures and every era in our history. Each of these writers has chosen to tell a personal version of a trickster tale, some based on previous tellings and others making departures from the traditional folklore. In most the trickster is tested and proves powerful, but fallible. That is as it should be. It's difficult for me to choose the best, or even 'my favorite' from this excellent anthology. If I start to describe them, I will not know where to stop. But, each story is worthy of its inclusion for a variety of reasons...the tone and the content, the humor and the terror, the elegance of the writing and the the range of the telling. These authors know how to create an anthology that will delight, and give pause. It is worthy of our attention! An editor's note adds to our store of knowledge about the tricksters of the world. We also catch a glimpse of each of the featured authors. "After Father goes, I find Weed in the herb garden, sitting very still among the plants. I bring him some water. He takes it with a look of gratitude but says nothing, and I have no choice but to leave him be. An hour goes by, then another. At times I swear I can hear him speaking quietly - but with whom?" I was not prepared to like this book, and I cannot tell you why. Luckily, I gave it a chance to capture my attention and provide me with yet another worthwhile read. I liked the writing right from the beginning. Jessamine lives a quiet and often lonely life while her father, a stern and harsh apothecary, moves among the people of their community helping heal and cure illness. He is obsessed with his gardens, and works diligently to find power in plants, especially the poison plants in his apothecary garden. Jessamine is not allowed entrance! "And yet, as I look about, I am forced to admit: On its surface, the apothecary garden is not so very different from any other garden. There is the smell of rich earth, the green plants growing quietly in their beds, the soft hum of bees making their rounds." When Jessamine falls deathly ill, we learn much about the evil that is in the world. It becomes a story of sacrifice made in the name of love and the lengths to which people will go to get what they want. The abrupt and surprise ending will leave readers wanting more of the story. Since it is planned as a series, we hopefully won't have to wait too long. Maryrose Wood is a wonderful writer. Her language is inspired and her setting realized through dramatic word choice and exceptional description. She has created memorable characters, especially Weed and Oleander, whose battle will live long in your memory. I hope to meet them both again! The Poison Diaries was inspired by the current Duchess of Northumberland's public English gardens, and an idea that she had for a story set there. You can hear more by searching The Poison Diaries on YouTube. There is a wonderful trailer and an interview with the Duchess. And if you are ever in the north of England, you might want to visit Alnwick Castle and her Poison Garden created there. This is Don Johnson's latest picture book written as a tribute to the life and teachings of Henry David Thoreau. His insight and inspiration came from a passage in Walden: "Not till we are lost, in other words not till we have lost the world, do we begin to find ourselves." 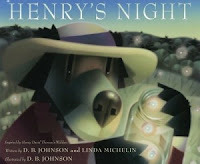 It has the appearance of a bedtime story...showing Henry as he listessly seeks sleep, while the sounds of the village surround him and disturb his peace. There is only one sound he wants to hear...the song of the night bird. He knows he will not hear the bird while still in the village, so off he goes to find solace and solitude in nature. He gathers fireflies in his jar as he walks along, always alert to the sounds that envelop him. It is after ten o'clock when he hears the song he has been seeking...the song of the night. As he follows the lure of the whippoorwill, he is one with the creatures of the woods, always asking their advice and listening for their answers. He plods on, sure that his search will be fruitful. After much walking and a concern for being lost, he floats a raft down an unknown river and the bird finds him, perching atop his hat and accompanying him for the rest of his journey. Each journal entry is placed on gossamer pages of infused light. The charming and delicate verses share space with detailed small sketches of the discoveries made on his trek through the woods. The double-page spreads are filled with delicate lines and images that inspire feelings of peace and contentment, and sleepy delight. The song of the night bird will long be his companion! This is a magical addition to D. B. Johnson's previous four books that bring Thoreau's ideas to a young audience. 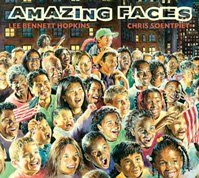 I have had so much fun sharing this wonderful book with both kids and adults, in classrooms and in workshops! Can you tell when you look at the cover? Are those a rabbit's ears or a duck's bill? That's what it takes to create a magical book to be shared and shared again. Two people are trying to make the final decision about the illustration...each has a perfectly good reason for an opinion, and neither can agree with the other. It goes back and forth. Is that a piece of bread looking for a home between the rabbit's ears? What's that carrot doing aiming itself at the back of the duck's head? Who comes up with these ideas and how do they construct such an amazing book? It is hilarious and so smart. Kids from the earliest age will get the joke and be enamored of it. Everything about it is great...right down to the zebra on the back cover sporting an awesome UPC! Well, it looks like a zebra! While the backgrounds may change, the singular image never does. That is painfully clear and yet, there are times when you find your view skewed by the dialogue. It will be loved by one and all. Early readers will soon be reading it verbatim to anyone who will listen and be charmed. I LOVE it! "There is no cold in Havana, only sunshine and warm rain. The city's avenues are lined with arcades of coral-stone archways, ancient doors, and window frames painted bright as birds-of-paradise. The vivid colors are accented everywhere by the deep mahogany of Havana's window shutters and ceiling fans." 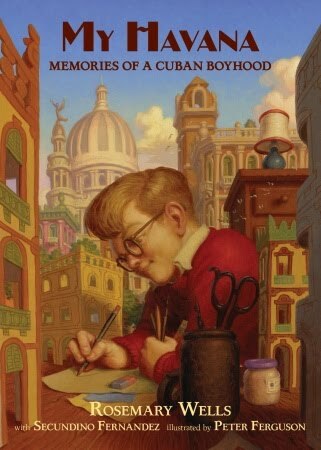 Subtitled "Memories of a Cuban Boyhood', this is a story that took some time to write. It began with a radio broadcast, heard by Rosemary Wells, which presented a most interesting Cuban emigre, Secundino Fernandez. He was an architect and he shared the story of leaving his beloved birthplace, the beautiful city of Havana. He was just ten years old when the family was forced to leave and his homesickness was deep and heartbreaking. Rosemary Wells says that his story stayed with her for a long time and she was finally able to find Secundino, living close to her neighborhood in New York. The two collaborated to tell this story from his birth in Cuba, through years spent in Spain before returning to his beloved country, and finally emigration to the United States when Castro came to power in Cuba. "New York is a terribly black and gray city. The weak, white sunshine has no more warmth than a candle. Like in Madrid, not a tree grows on New York's streets. No one here in the land of ice could bring a table outside to play dominos." Even his language is determined by what he sees: "When you fall and scrape your skin on pavement," I want to tell him, "that is how New York feels against the eye." "With great care I cut my favorite buildings out of cardboard. I paint archways and balconies, drawn to scale with a ruler, compass, and pen. Streets large and small spider out across the floor of my bedroom. One night I make the capitol, another night the Roosevelt Hotel in honor of my parents' first meeting. The Cafe Loro Azul, its neon parrot in blue and silver ink, takes its place on the Calle San Lazaro." "The salty air is as mild as on the Malecon, and the spray coats our arms. New York sunlight, shimmering with the promise of summer, settles around my shoulders like the arms of my mother. It is almost like my Havana." Peter Ferguson's glorious artwork adds a depth of emotion and intensity that cannot be ignored. Dino comes to life in these illustrations, as does Havana. The warmth and depth of his color palette, the varying perspectives and the pencil sketches create a perfect tone for the feelings shared. "The debt your father owes is a very great sum indeed. Three hundred pounds. Many a laborer of maid lives on twenty a year - often far, far less. Unless your father can find a way to pay this Mr. O'Doul during these next few days, his prospects for the future are, shall we say, quite without...hmm...luster." You do know by now that I like to read books about Victorian England with interest and a sense of foreboding. The conditions are always so bleak. I have also developed a growing interest in mystery stories...which were not always my category of choice (such a thing may, at some future point, lead me to try my hand at science fiction??). The Traitor's Gate immediately places its readers in the milieu that is Victorian London and its legal system. Punishment is swift and harsh. John's father is a would-be actor, an inveterate gambler and in big trouble! His debts are out of control and he is being sent to debtor's prison until they can be paid. He says he has small debts to many, but does not owe Mr. O'Doul anything close to three hundred pounds! As he faces prison, he asks his son to visit his old aunt and ask for her help. Why won't Aunt Euphemia help her only living relatives? Why does Mr. O'Doul claim that he owes so much? Who is the ragged girl who seems to be wherever John is, and why is she following him? There are many twists and lots of mystery surrounding this fast-paced Victorian drama. The description of London is graphic and leaves little to the imagination about living conditions of the time. Readers have to pay attention to the clues given, and frustration can build as one lead gives way to another. John is a great character, who moves from being naive and trusting to cautious and questioning, never knowing exactly what part the various people are playing in the intricate plot to capture a traitor. Although he is disillusioned by some of the events as they unfold, we are left with the feeling that we might see more of John and Sary the Sneak. He will long remember her final words to him: 'This girl 'as a 'eart, too!' I would look forward to meeting them again. In an afterword, Avi explains that some of the events from Charles Dickens' life have been used to craft this story. As well, he uses London as central to the story...almost a character in itself...because of his connection to the glorious city. He is thrilled to have had the opportunity to give it life in his story. "Personally, I was tired of not reading about poop. Most history books just don't talk about it, but they should. Poop is important, and we can't afford to ignore it. Eliminating waste is something every living thing does. Figuring out how to deal with poop has been an issue since people started living in groups, and it's still an issue." 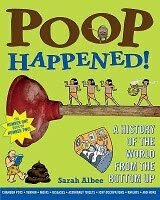 Any book that has 'poop' in its title is going to draw readers and fans. That being said, I hope that others will take the time to read much of what has been written here...it is fascinating, to say the least. The table of contents lists eighteen sections, plus sources, and acknowledgements. Each section is organized into other sections that will attract interest, provide information and be accessible to its intended audience. There are historical bits, the whys for caring about such a topic, lists of terms used and some gross and disgusting facts that will make your head spin. Lest you wonder why we are discussing 'poop' in historical terms, you need to know we have made progress but 'more than a third of the world's population - 2.6 billion people - still has no decent place to go to the bathroom.' Aren't we lucky? If the plumbing is bad, so is the news for people who must live with it...three of the four ways to catch a germ have to do with bad plumbing. Had enough? That is really only the beginning. The author uses the history of poop to help us understand why waste removal is so important, as it affects the health of so many. Knowing just how many diseases are caused by poop makes you never want to read about that disease again. Do you find yourself wondering how knights in full armor relieved themselves? Take note that it took a squire an hour to get his knight suited up. Battles often lasted for hours...where would you go? Poor squire...not much fun cleaning up all the blood, never mind the sweat and poop. There are a lot of 'ewwws!' involved as you pore over this book...and there are many things I really didn't want to know. But, know them I do and I will probably not forget some of them. The more you learn about the past, the happier you will be living now...with relatively clean bathrooms, and the ability to get rid of waste in privacy. Still, there are some facts that will 'plague' me for the near future: "In public bathrooms, you're better off drying your hands with a paper towel than using one of those hot-air dryers. Rubbing your hands under the hot-air device actually increases the bacteria flying around the bathroom and increases bacteria on your hands by 162 percent. Paper towels decrease the level by 29 percent." EWWWW! Not only is there much information to read, there are also hundreds of illustrations. Some are cartoons, some archival photographs and posters, and some drawn to evoke an era in the history of waste and waste removal. It's a highly interesting way to look at the past! "Granny liked her big house. It had lots of room for her potted plants, her drums, her mountain-climbing gear and her jigsaw puzzles." "'Cats and dogs are nice, but they are not very special,' William said. 'You need a special pet.'" Off he goes with his idea and Granny is soon the recipient of a new baby...a pig! Granny and Jigsaw find that they have much in common and they happily share Granny's space. The fact that he doesn't remain a 'little' pig soon causes a host of difficulties, as you will discover when you read this book. This is a Granny not averse to hard work, with lots of ideas up her sleeve. A barn is the order of the day. 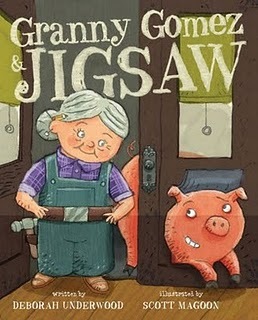 Granny dons safety glasses and wields hammer, power saw and nails to construct Jigsaw's new home. The barn has everything that Jigsaw needs, except Granny. They soon discover how much they enjoy each other's company and a new solution must be found. It doesn't take long! The story moves along with humor and great affection as the two flourish in their shared life. The characters are appealing and will win favor with their audience. The artwork is understated, with soft sweeps of color and details that give the reader additional information about the two.